Available in Square and Rectangle Designs. See pricing here. 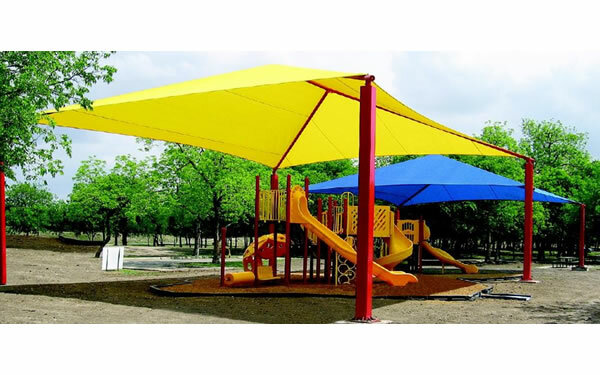 Our 4-post square and rectangular shade structures, also known as Hip Roof playground shades, are a great addition to your playground. They will hip up to about 11 to 15 ft at the ridgepole, or even higher depending on the size. 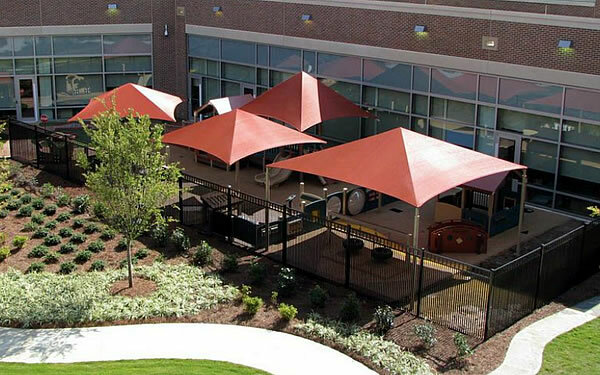 These hip roof playground shades are the classic design for creating shady areas on commercial playgrounds. This design provides maximum strength for the canopy-support structure and the canopy, based on the strength of the posts’ size and rigidity in the ground (they’re usually secured by concrete). The vertical posts at each corner of the shade support the sturdy overhead structure to which the canopy attaches. The exterior posts secure in the ground with concrete, providing the strength to support even colossal canopies that cover an entire play area. (For larger shade structures, more than 4 posts may be needed; 6 or 8 posts may be needed for larger shade structure design.) The shade canopies are designed to withstand winds up to 76 mph and 90 mph for wind gusts up to 90 mph. The shades’ steel structures are rated to withstand winds of 140 mph with the canopy off. 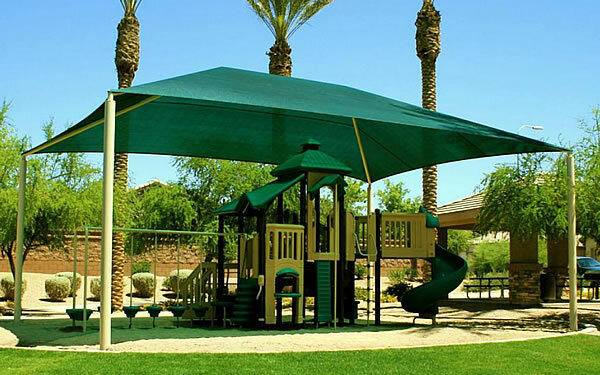 On every shade, the fabric canopy can be removed easily, using a patented quick-release system. Each shade structure is warranted for 10 years. Sizes: We offer many sizes and heights of hip roof square and rectangle shades. Canopy sizes start at 10′ x 10′ and are available in 2-foot increments (10′ x 12′, 12′ x 12′, 12′ x 14′, 14′ x 14′, and so on), up to any size you need. Heights available: Shade heights are listed as ENTRY heights, which is the height of the edge of the shade above ground level. Our shade structure heights start at 8′ high (which is about 11 or 12 feet high in the middle of the canopy) and increase in 2-foot increments. For covering an area with no play equipment, 8′ height is fine. 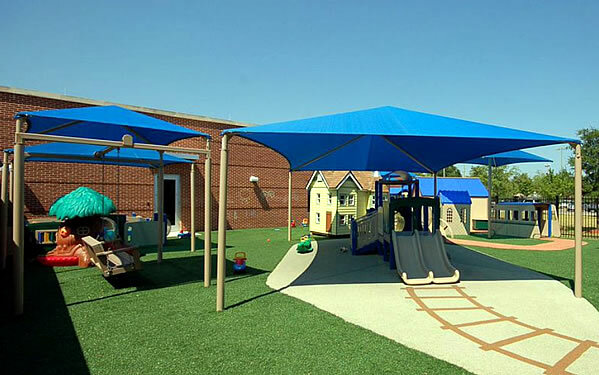 For covering playground equipment, you’ll probably need a higher canopy. The rule of thumb is, you need 84″ of clearance above the highest designated play surface of the play structure (the highest point that children are supposed to be standing on; in most cases, this is the highest platform). Canopy features: UV screening of up to 99% UV screening, and shade cover of up to 92% (depending on the color of the shade’s fabric). Water repellence levels of 80%. Fabric colors available: Several colors available. Please see diagram on this page for sample colors. 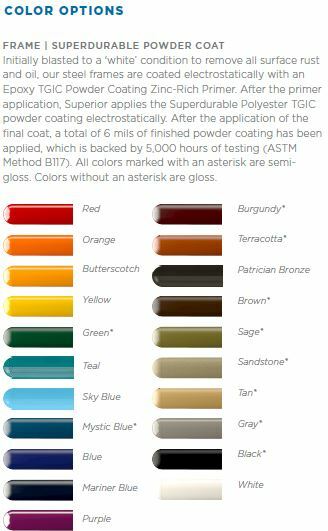 Powder coating colors available (for the vertical posts): Several colors available. Please see diagram on this page for sample colors. Please note that pricing shown below does not include freight or installation.List prices are subject to changes due to commodity cost fluctuations, prices shown are an estimate. It is always safer to phone us. It does include a quick-release system that uses “glide elbows” at the top of each corner post (the recommended configuration for seasonal removal of shade fabric). Pricing shown is for structures with vertical posts that secure in the ground with concrete, but a surface-mount option is also available at additional cost (approx. 15% higher). Sizes shown below are standard sizes, but we can custom-make a playground shade to any size. For an official estimate, please phone us toll free or contact us. Get More for Less! For less than $100 more than the 10′ x 10′, buy a 12′ x 12′ (shown below) with 44 more square feet of coverage! Get More for Less! Get 44 more square feet of coverage than the 10′ x 10′ for about $100 more! See our 12′ x 12′ model below.